Today’s publication of the British Social Attitudes report has prompted numerous media reports that racism is on the rise and that attitudes to immigration are hardening. Many similar recent reports and debates say the recent recession and resulting austerity measures are part of the reason for this. But new research by Professor Tim Hatton at the University of Essex tells a different story. Today he writes for Society Central about the forces that have been in play since the onset of the financial crisis and speculates about what the outcome might be for immigration policy. The recent anti-immigration rhetoric in political discourse and in the media is sometimes interpreted as if it reflects a radical shift in public opinion. It does not. Opinion has responded to the recession in predictable ways but the scale of such changes has been modest. In the recent elections for the European Parliament right wing populist parties have made significant gains. Some commentators have linked their electoral success to growing anti-immigration sentiment across much of the EU. In response, the mainstream parties have upped their resolve to clamp down on immigration. In major recessions jobs become scarce and fiscal budgets become tight. It is widely believed that this creates the conditions for a backlash against immigration. Such views draw on a range of historical experience. The 1920s and 1930s saw a dramatic tightening of policy in the major immigration countries in the face of deep recessions. And the oil shock-induced recession of the 1970s brought European guest-worker policies to an abrupt end. Is history repeating itself in our time? The place to start is with public opinion, which we know far more about now than we did in the past. One useful source is the European Social Survey (ESS), which has canvassed opinions in most European countries every two years since 2002. The ESS has asked the same six questions on immigration. This is important because much of the existing academic commentary looks at differences across individuals at a point in time, not at how average opinion changes over time. As the depth of the recession differed sharply across Europe, it is possible to compare countries where the recession was deep with those where it was not, both before and after the crisis. So what do we find? Let us focus on a question that asks “Would you say it is generally bad or good for (your country’s) economy that people come to live here from other countries?” The responses are recorded on a scale of 0 (very bad) to 10 (very good). Three features stand out. First, the average scores cluster around the middle of the range (a value of 5), with Greece exhibiting the most negative opinion (3.53) and Switzerland the most positive (5.96). On average across Europe pro-immigration and anti-immigration opinion are roughly balanced. Second, the change in opinion has been modest. Across 20 countries the average score fell from 5.04 in 2006 (before the recession) to 4.78 in 2010; a pretty modest change. But, third, we do see opinion becoming more negative in the countries most severely hit by the recession, notably Spain, Greece and Ireland. Among those not so badly affected, the trends are comparatively flat. Note: the distance between grid lines is one point on the 0-10 scale. To the extent that the recession changed opinion, there were three key drivers. 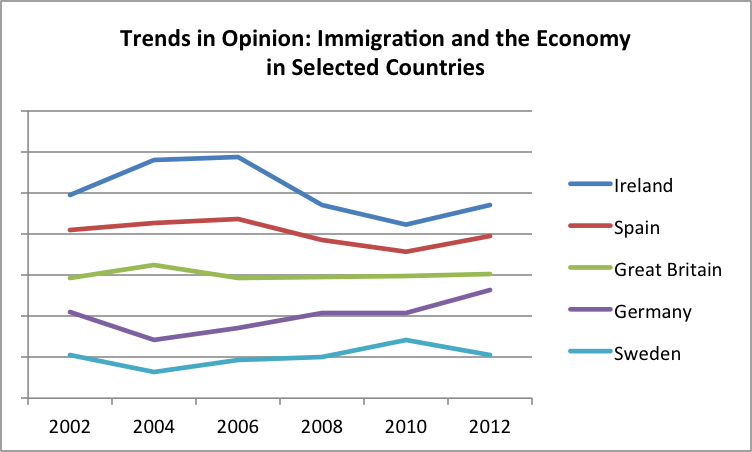 Contrary to some views, the share of immigrants in the population had a negative effect on opinion. Rising unemployment soured attitudes but only marginally, and so labour market pressures do not seem to be crucial. More important was the negative effect rising social spending and expanding budget deficits, the source of much recent concern. Overall the recent surge in support for right wing populist parties does not seem to have been driven to any great extent by a Europe-wide surge in anti-immigration opinion. Rather, by combining or conflating their euro-sceptic and anti-bailout platforms with a broad anti-immigrant stance, such parties seem to have found a combination that taps into a segment of pre-existing attitudes. By the same token a return of more benign conditions, and its likely modest effect on public opinion, may not reverse the political trends. After all right wing populism was on the rise before the recession. Indeed, the surge has been strongest in the countries of northern Europe and particularly among those least affected by the recession. So how should we expect this to translate into changes in immigration policy? 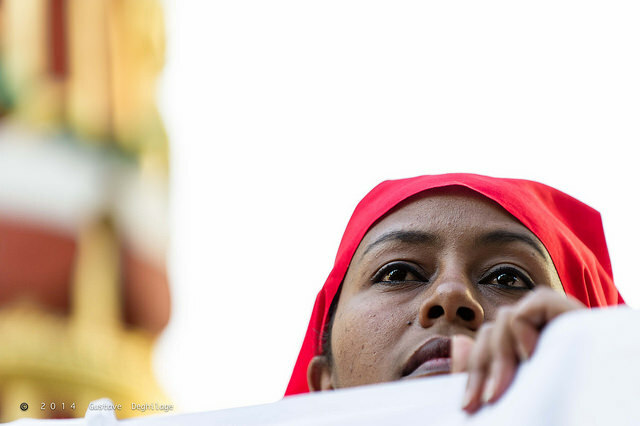 Political imperatives are driving governments in the direction of tougher immigration policies. This is partly because of the political challenge. But focusing on immigration has also served to deflect attention away from other issues, notably the economy, where they are seen by many to have failed. However, there are also constraints to such actions. A glance at the immigration statistics suggests one reason why. Typically around half of the foreign-born are other Europeans who have the right of entry. This is unlikely to change significantly, however much some politicians may wish for it. Source: OECD, International Migration Outlook 2013, Country Notes. The second is family reunification. Unlike asylum, which is now a very small share of the inflow, family reunification is a major source of immigrants—about one third on average. This too is governed by international conventions and by EU directives and recent attempts to narrow the scope of family reunification have fallen foul of the European Court of Justice. What remain are the employment stream and the student stream, both of which recruit on skills and abilities, the economic value and fiscal benefits of which are widely acknowledged. But the employment stream is typically only 10 percent of the total. Further restricting the highly skill-selective inflows from outside the EU is possible in the few countries where the numbers are substantial, but it may not win many votes. The bottom lines are these. The recent anti-immigration rhetoric in political discourse and in the media is sometimes interpreted as if it reflects a radical shift in public opinion. It does not. Opinion has responded to the recession in predictable ways but the scale of such changes has been modest. The imperative for tighter immigration policies lies in the political arena rather than in the court of public attitudes. But while tougher policies are clearly on the cards there is a range of constraints that is likely to limit the scale of the policy backlash. Timothy J Hatton (2014), “The Slump and Immigration Policy in Europe,” IZA Discussion Paper No. 7985.Available at SSRN: http://ssrn.com/abstract=2403122. Timothy J Hatton (2014), Hatton, T J (2014), “Public Opinion on Immigration: Has the Recession Changed Minds?” CEPR Discussion Paper 10008. Available at CEPR: http://www.cepr.org/pubs/dps/DP10008.